ARCTT is a peer-reviewed journal covering a wide variety of topics of interest to the mental health, neuroscience, and rehabilitation communities. The mission of ARCTT is to provide systematic, periodic examinations of scholarly advances in the field of CyberTherapy and Telemedicine through novel experimental clinical studies or critical authoritative reviews. It is directed to healthcare providers and researchers who are interested in the applications of advanced media for improving the delivery and efficacy of mental healthcare and rehabilitative services. 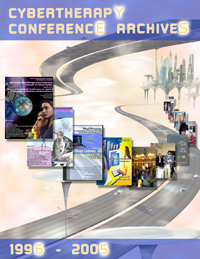 This first Volume of ARCTT offers the reader a collection of 15 of the best manuscripts from the 2003 CyberTherapy Conference. It offers critical reviews, evaluation studies, original research, and clinical observations as well as includes all abstracts from the 2003 conference. ARCTT is a peer-reviewed journal covering a wide variety of topics of interest to the mental health, neuroscience, and rehabilitation communities. The mission of ARCTT is to provide systematic, periodic examinations of scholarly advances in the field of CyberTherapy and Telemedicine through novel experimental clinical studies or critical authoritative reviews. It is directed to healthcare providers and researchers who are interested in the applications of advanced media for improving the delivery and efficacy of mental healthcare and rehabilitative services. 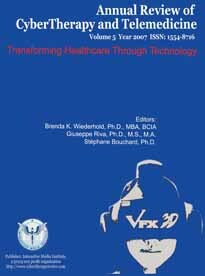 This second volume of the Annual Review of CyberTherapy and Telemedicine (ARCTT) offers an even more extensive selection of manuscritps than the previous years. The editors-in-cheif, Drs. 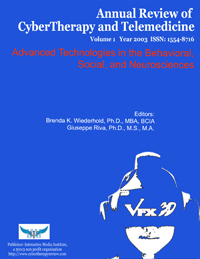 Brenda K. Wiederhold and Giuseppe Riva, have included 17 from the area of critical reviews, evaluation studies, original research and critical observations as well as all the abstracts from the 2004 CyberTherapy Conference. ARCTT is a peer-reviewed journal covering a wide variety of topics of interest to the mental health, neuroscience, and rehabilitation communities. The mission of ARCTT is to provide systematic, periodic examinations of scholarly advances in the field of CyberTherapy and Telemedicine through novel experimental clinical studies or critical authoritative reviews. It is directed to healthcare providers and researchers who are interested in the applications of advanced media for improving the delivery and efficacy of mental healthcare and rehabilitative services. This first Volume of ARCTT offers the reader a collection of 28 of the best manuscripts from the 2005 CyberTherapy Conference. It offers critical reviews, evaluation studies, original research, and clinical observations as well as includes all abstracts from the 2005 conference. A decade ago, CyberTherapy, then still in its infancy, only existed as a specialized Virtual Reality and Behavioral Healthcare Symposium at the Medicine Meets Virtual Reality (MMVR) Conference. At that first session, Dr. Ralph Lamson presented a small study on virtual reality (VR) exposure for treatment of acrophobia in ten participants. It is now clear that in 1996, we had only begun to realize what promise might lie ahead for both VR technology and the CyberTherapy Conference. Much has changed over the past ten years and we have now tapped further into VRMIs™ potential than many of us could have ever imagined. Today, researchers from around the world are busy completing hundreds of trials, applying VR for such varied disorders as Anxiety, Eating Disorders and Obesity, Addictions, Erectile Dysfunction, Autism and Schizophrenia. In addition, VR for Neurorehabilitation and Physical Rehabilitation has shown definite success, as has VR for other such diverse areas as Pain Distraction (both acute and chronic), Education, Training, and Physical Disabilities. I am proud to report that as VRMIs™ use in Behavioral Healthcare has grown, so has the CyberTherapy Conference. What began as a specialized symposium at MMVR concerned mainly with conceptual matters, has now grown into the largest program on controlled clinical trials of VR and other advanced technologies in the areas of behavioral healthcare, rehabilitation, disabilities, education, and training. 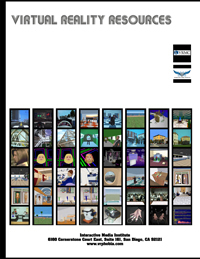 To celebrate a decade of Virtual Reality Research, the CyberTherapy Archives serves as a collection of all abstracts from the past ten years. We, at the Interactive Media Institute, realized early on that it was relatively difficult for professionals wanting to break into the Virtual Reality (VR) field to locate relevant information. While the material was out there, there was no clear organizational structure or database to link it. To solve this problem, we have put together Virtual Reality Resources, a relevant compilation for researchers and clinicians alike. Virtual Reality Resources offers a clear overview of the advantages of using VR for Cognitive-Behavioral, Neuropsychological, and Physical Assessment and Intervention Applications. Further, it includes pertinent logistical information on such diverse topics as Basic Cost/Benefit questions, CRISP Grantees, necessary technology, and significant websites. Finally, the selected bibliography is an excellent guide for anyone looking for a deeper understanding of what scientific manuscripts have been published and what work still needs to be done. We are confident that this collection will not only advance your personal knowledge, but through its clear organization and accessibility will aid in promoting the VR field as a whole. Anxiety disorders are the most common mental health disorder diagnosed by primary care physicians, but they are particularly challenging to treat, often requiring long-term therapy. 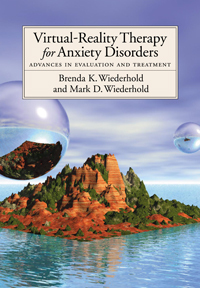 In vivo exposure and de-sensitization to the anxiety-provoking scenario are usually effective treatments, but they present a number of practical difficulties for both therapist and patient. Virtual Reality Therapy for Anxiety Disorders explores how the latest virtual reality interventions can be used to treat patients with anxiety disorders. Virtual reality therapy enables the patient to experience a realistic, yet carefully controlled exposure to an anxiety-provoking scenario, in the therapist’s own office. While virtual reality environments were initially quite costly and demanded powerful computers, their price has decreased of late, making this form of treatment an intriguing option for therapists. The authors, who are themselves experienced VR therapists, provide detailed guidelines on how to conduct VR treatment with patients suffering from various anxiety disorders. They provide not only an overview of the equipment used and the basic principles of treatment, but also discussion of virtual reality therapy for specific disorders including panic disorder and agoraphobia, obsessive-compulsive disorder, fear of flying or driving, claustrophobia, arachnophobia, and fear of medical procedures. Tips and caveats are provided, making this book important reading for therapists interested in exploring an exciting new therapy modality. ARCTT is a peer-reviewed journal covering a wide variety of topics of interest to the mental health, neuroscience, and rehabilitation communities. The mission of ARCTT is to provide systematic, periodic examinations of scholarly advances in the field of CyberTherapy and Telemedicine through novel experimental clinical studies or critical authoritative reviews. It is directed to healthcare providers and researchers who are interested in the applications of advanced media for improving the delivery and efficacy of mental healthcare and rehabilitative services. copyright © 2018 Virtual Reality Medical Institute (VRMI), Prekelindenlaan 64, box 5, 1200 Sint-Lambrechts-Woluwe, Belgium. All rights reserved. VRMI does not accept any liability for content, not for any content published through links herein.